I've been trying to kill several birds with one stone by reviewing unanswered questions with the blacklisted installation tag. This has been effective thus far. I thought it was a minor hiccup so I removed all the tags and put the appropriate ones back with the same result. Please, please, don't mindlessly replace the installation tag with system-installation or software-intallation, and review all the tags! 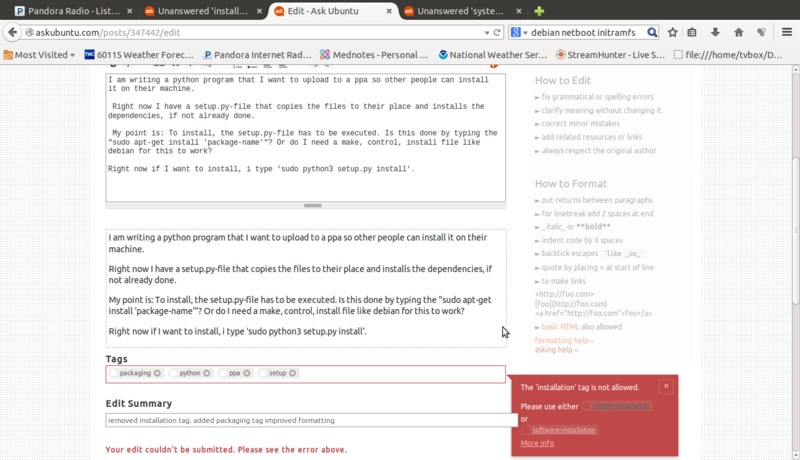 The problem in that question is the setup tag which is synonymized to installation. You are not removing this tag, hence the system nags at you.